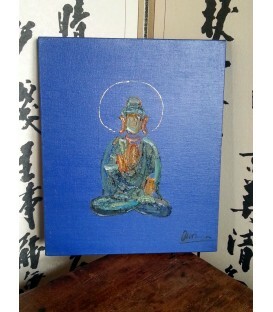 Contemporary oil painting, probably from China, of a Buddha figure on a blue background. The artist's signature is illegible. Dimensions: length 35cm (14"), width 29cm (11.5"). 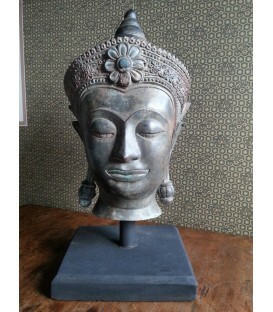 Thai Buddha head in 18th century Ayutthaya style. High quality reproduction cast in bronze and mounted with a black steel rod on a square black wooden base. Dimensions: height 50cm (19.5") including base; height 40cm (16") excluding base; circumference 67cm (26.5"); width 25cm (10"); base 23cm x 23cm (9" x 9").